I purchased this ottoman for use in a small sitting room. The size is perfect for putting your feet up. It's also the right size for a tray with beverages. 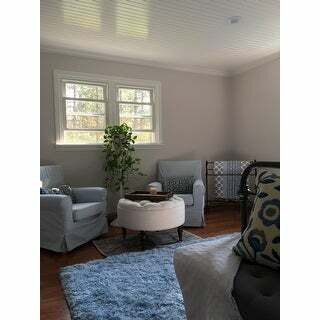 The color of the linen fabric goes with most any decor. The turned legs and metal casters add an elegant touch. 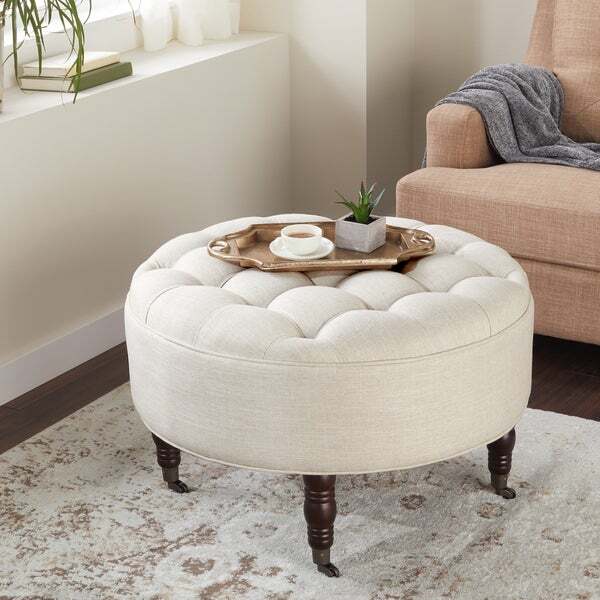 Add a hint of traditional style to your home with this elegant round ottoman from Abbyson Living. Crafted from sturdy hardwood with linen upholstery, this white ottoman features a tufted seat design for an extra touch of luxury. Use this ottoman as a foot rest, an extra seat, a surface to place items such as magazines and serving trays or an accent piece to complement your decor. At 30 inches wide, this ottoman is large enough to offer extra seating for guests as well. Looked all over for the perfect tufted round ottoman and found it here! the color is a soft off-white, not cream at all. The legs do have the rollers on but I actually like that cause it does make it easier to move from place to place. This ottoman looks more expensive than the pictures. It is the perfect addition to my gray couch! Love this, but wish I would have used scotch-guard on the product before using. This piece works great at a coffee table with a tray placed on top in my tiny living room, but also provides a foot rest if I want to sit and read in my high-backed chair, or additional seating. I have two small chairs and this great ottoman in my bedroom for a small seating area. Not to say the ottoman is small. It's perfect. I keep a wooden tray on it so that it can be used as an ottoman or a coffee table. I am happy with this ottoman!!!!! this is just what i needed. its nice and light (for me thats a good thing) but looks high quality and seems well made. it rolls nicely, even on carpet an the top is nice nad plush but still sturdy. i'm very happy with the ottoman! It's big, firm and pleasant. The legs aren't extra strong and the wheels will dig into wood flooring. If used by adults, you'll be thrilled. Not to be used around rambunctious kids, or large pets. The legs will break and the wheels will gauge flooring if you allow it. 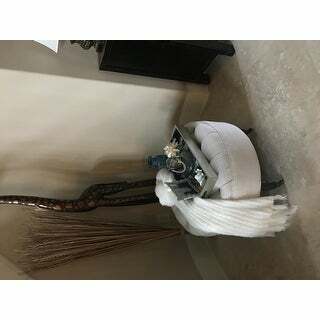 Although larger than I expected, it is a great ottoman and fits in well with different furniture arrangements. 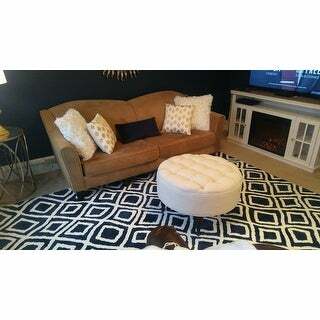 This ottoman works well in our space! Not as white as I thought and I am grateful for that; has a more twill-like sheen to the fabric. Just the lightest of a beige color, would be the best way to describe. The legs are dark brown with wheels. Mine is a little squeaky when you slide it across its wheels, but not anything that couldn't be fixed with a little oiling. Seems sturdy and can be sat on up to 275 lbs. it appears. just as pictured. very sturdy, and durable. pretty soft color of cream. I love this even after 2 yrs of use it’s still super sturdy and pure cream and sift. Doesn’t even look worn at all though I use daily. I had a super hard time finding the perfect sized ottoman but this one was it! Absolutely love it. Others I was finding were just way too small and much lower than my sofa. I wanted to create more of continual flow between the two pieces for lounging/laying/sleeping. Love! This is a great piece of furniture. It works great for a coffee table. I love the color and the material. It was very easy to put together. The wheels don’t roll across the floor easily but overall I am pleased with the look. Love it.... the perfect size. It adds warmth to my foyer and everyone loves it. The color is bright and and regal. The wheels work great on my he’d floor. I love it. It is exactly as described. Was a little disappointed that first delivery was wrong color so a little inconvenienced having to bring it to ups store for return and then having to wait for new one. I was hoping to have it for a party wanted the room to look complete so that was disappointing however I love the product it looks beautiful. My favorite piece of furniture in the room! I saw this identical item advertised elsewhere stating max wt. limit is 275 lbs. I own this and it is a gorgeous piece of furniture and I can attest to the fact it would hold that weight . "How tall is this ottoman without the legs?" "Do the legs of this ottoman come unattached?" "This is listed as white: is this a true white?" It is not a pure white. It is a very light cream. "Can the wheels be removed?" "Hi, Please advise the height of the legs, including the castors, from the ground to the underside of the ottoman. Thanks"
The height of legs is 8.75''. "Does this have rollers on the feet?"